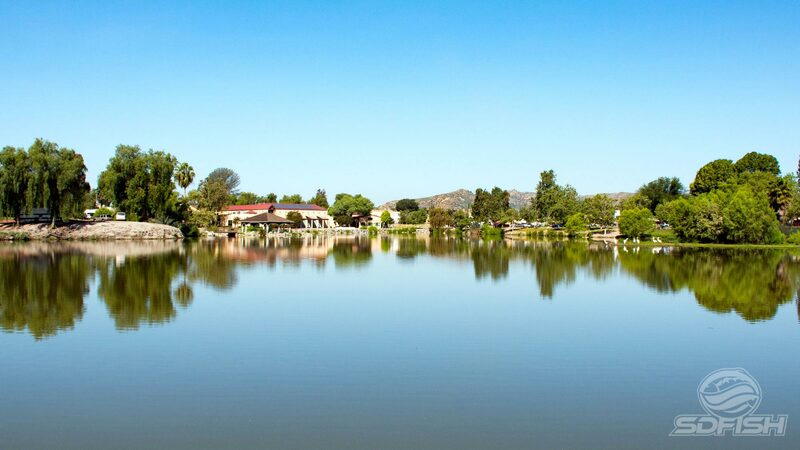 Lindo Lake is a very small and shallow natural lake in downtown Lakeside 20 miles northeast of San Diego. Lindo is essentially a pond, with stained to muddy water and very few fish attracting structures. But it is free to fish, and there are fish present to be caught. Lindo is one of the very few urban fisheries in San Diego County, and therefore receives regular stocks of rainbow trout from the California Department of Fish and Wildlife in the winter months. It also receives channel catfish stocks periodically in the summer. Aside from the fish that are planted, there are bass, bluegill and carp present year-round. The Lindo Lake County Park is open daily from 9:30 AM to sunset. In addition the lake, the park also houses baseball fields, tennis courts, horseshoe pits, a community center, skate park and a 1.5 mile walking trail around the lake.